Teaching is not a job that will often make you rich. Unfortunately, teachers rarely get paid what they deserve for the massive value they provide to students. Thankfully, there are many ways for teachers to make extra money if they have the time. Here are the best side jobs for teachers to earn extra money. Some side hustles for teachers require you to take advantage of something you already own. If you have a car or own a home, you can make extra money without needing a specialized skill. If you have a car, you may want to consider becoming a rideshare driver. To do so, all you need to do is sign up with a company like Lyft, then start driving people around town. Being a rideshare driver is one of the better side jobs for teachers as you create your own schedule and requires little specialized skill. You get paid on a per minute and per mile basis when you’re driving a passenger around town. It’s a great way to earn extra money in the evenings and on weekends. You can earn tips, too. Lyft also offers a $250 sign on bonus for new drivers. Lyft even offers weekly power driver bonus rewards if you can drive when you’re most needed and meet the bonus requirements. Check out our guide on how much money you can make driving for Lyft to learn more about this opportunity and requirements. If you have a car but the idea of driving other people around sounds awful, you can still make money using your car. People love eating out, but sometimes they don’t want to leave the comfort of their home. Unfortunately, many restaurants don’t deliver. This can be inconvenient, especially if you’re craving a meal from your favorite restaurant. That’s where food delivery services like DoorDash and UberEats come in. First, check to see if DoorDash or UberEats delivers food in your area. If they do, consider signing up to make extra money delivering meals. As a former pizza restaurant employee, I should warn you that your car may end up smelling like the types of food you deliver. If that isn’t a big deal to you, and you want to set your own schedule, food delivery is one of the best side jobs for teachers. Keep in mind that the busiest times are when people want take-out food. This means you’ll need to be available during these times if you want to make as much money as possible. If you have extra space in your house, or own a second property, consider renting out a room on Airbnb. You can even rent out your whole home while you’re on vacation. If you live in a tourist destination like I do, renting out your home in the summer can earn you some major money. Airbnb allows you to rent out your whole home, a private room, or a shared room. The best part is that it’s turning an unused portion of your home into passive income. Airbnb does take a commission to keep their site running, but listing your home is completely free. They even offer $1,000,000 in protection for property damage. You can request guests to provide ID before booking to make you feel a bit more comfortable about who you’re allowing in your home. If you don’t feel like driving around or renting out your home to make extra money, there are still plenty of other side jobs for teachers. The best ways for teachers to make extra money often involves using skills they already have. Here are a few ways for teachers to make extra money that most teachers should easily be able to handle. You don’t have to be an English teacher to teach English as a second language to children in other countries. Teaching children in other countries is one of the best side hustles for teachers as you already have the skills to teach, and can easily meet the necessary requirements. Gogokid and SayABC both allow you to teach English from home and make extra money in your spare time. SayABC allows you to earn up to $21 per 40 minutes class while Gogokid pays up to $25 per hour and offers 30-minute time slots. The open time slots vary by day with daytime, evening, and weekend hours. Gogokid also offers a $300 bonus for new teachers. All you need to teach English online from home is access to a computer with a webcam and the willingness to teach. You don’t need to deal with creating the course work; that is handled by the company you work through. If you aren’t tired of grading essays at work, you might want to consider professional proofreading as a way to make extra money as a teacher. Proofread Anywhere offers a free course that teaches you how to be a professional proofreader for both general proofreading and transcript proofreading. The course also goes over how to build a client base to grow your business. Transcript proofreading tends to pay better, but general proofreading is also a well-paying side job for teachers, typically paying $20 or more per hour. Bloggers, authors, and other professionals need proofreaders for their work so there’s no shortage of potential clients. Teachers don’t just teach children. They teach adults, too. Online courses have grown like crazy in the last few years. If you have a unique skill or lesson you love to teach, consider making an online course on a website like Udemy. Udemy allows you to build courses you can sell to anyone that wants to learn what you have to teach. As long as you keep your course up to date, you can earn money from your course for as long as it sells. Creating courses is one of the top side jobs for teachers. Not only do you make money from your knowledge, it also results in semi-passive income. Have you worked hard to develop specific lessons or other teaching tools for your classes? If so, you can make extra money by selling those resources on TeachersPayTeachers.com. While some teachers love creating resources, it may be the worst part of their job for others. Take advantage of the work you’ve already done. Sell it to other teachers that are willing to pay for your resources. One of the best side jobs for teachers is teaching a course on the side as an adjunct professor. If you live near a community college or university, you may be able to pick up a couple classes in the evenings or summers to help pay the bills. While this side hustle isn’t a good idea for all teachers, some may enjoy teaching a class or two at community college or university. Freelance writing is a great way to make extra money. You can search for freelance writing jobs on websites like Indeed or LinkedIn. While those sites are good and can produce clients, I’ve had the best experience finding freelance writing jobs through my blog and meeting potential clients in person at blogging conferences. If you haven’t found a side hustle that you like yet, don’t worry. Here are a few more side jobs for teachers that might work for you. The best part is, most of these side hustles allow you to earn extra money when you want without locking you into a particular schedule. Babysitting is one of the most common, well-known ways to make extra money. If you want to make some extra cash babysitting, make sure to check out Sitter.com. Sitter.com allows you to post a profile and have families request your services. It also has a large listing of sitter jobs you can browse through to find the perfect job for you. While some of the jobs on Sitter.com require full-time hours, others only require nights and weekends or occasional babysitting duties. You may even be able to pick up a summer-only babysitting job to earn extra money during your summer break. Filling out surveys is another great way to make extra cash in your spare time. The best thing about earning money doing surveys is that you can do it whenever you have a few free minutes. You don’t have to set aside time on a regular basis or devote a whole weekend to earning cash. Instead, you could fill out surveys when you’re in the waiting room at the doctor’s office or when you’re for an oil change. Survey Junkie – Survey Junkie is our favorite survey site since they pay you cash straight to PayPal, or let you redeem rewards for Amazon gift cards. Check out our Survey Junkie review to learn more about how you can make money with this top survey site. Pinecone Research – They pay $3 per survey and they put cash directly into your PayPal account, or you can choose Amazon or restaurant gift cards. They also pay to do product testing. Global Test Market – Global TestMarket lets you make money for testing products and also asks for feedback on products you already use around your home. Global TestMarket has paid out over $30 million in earnings since 2016. You can redeem earnings as cash to PayPal or as gift cards. You won’t get rich taking surveys, but it can be an easy way to earn extra money for your budget. Want to earn cash back buying the things you already buy on a regular basis? Check out Ibotta as a way to make extra cash. The first thing you need to do is download Ibotta. After you have the app on your phone, add offers before you shop to qualify for cash back. Then, simply shop like you always do. Once you’re done shopping, take a photo of your receipt to earn cash back. It’s that easy! Check out our Ibotta review to learn more about the service and how it works. Have you ever thought of starting your own blog? It’s easier than you’d think, and you can get started today. I always recommend starting a self-hosted WordPress blog because it gives you the most options. You can do this with BlueHost. They help you set up your site so you don’t have to deal with the technical aspects of launching a site. Unfortunately, blogging isn’t a get-rich-quick scheme. It takes a lot of work to build a successful blog. That said, I earn my living blogging and freelance writing, so it’s definitely possible to make money doing it. There are many ways for teachers to make extra money on the side. If you’re a teacher that needs extra cash, try out some of your favorite ideas from this list of best side jobs for teachers. While many may not be the right fit for you, at least a couple of them should provide an opportunity for you to make extra money as a teacher. What are some other ways for teachers to make extra money on the side? If you’re a teacher, what do you do to bring in additional income? Do you take on opportunities available through your school, or do you look for a second job? 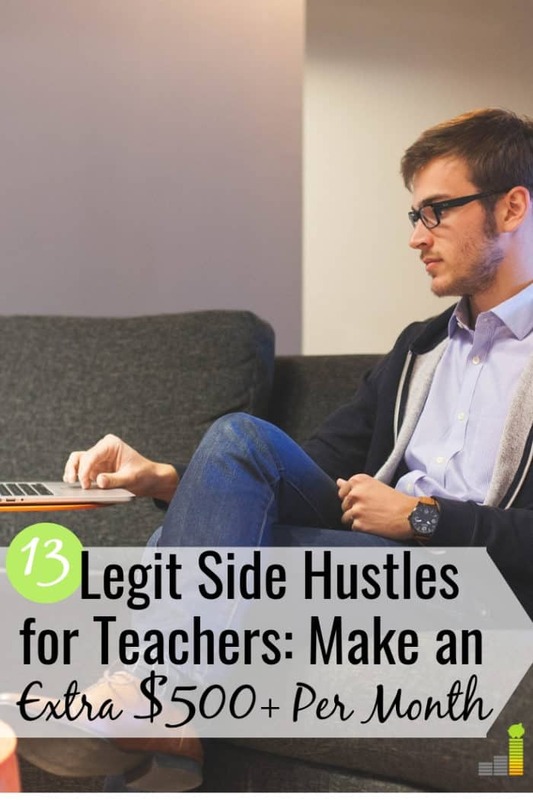 The post 13 Best Side Jobs for Teachers to Make Extra Money appeared first on Frugal Rules.